In the name of the holy cow, five human beings were killed, dragged from a police cell where they were being held and lynched by a mob, even as the police, upholders of the law, looked on. October 15 was Dussehra --- the Hindu festival marking the triumph of good over evil. Devotees thronged Dussehra carnivals all over north India and returned home happy. But Dulena village in Jhajjar district, Haryana, was to be the exception. Near that village, five youths belonging to one of the so-called low-caste dalit communities were allegedly beaten to death by a mob right outside a police outpost. The police, instead of doing their duty of preventing the murders, just watched as the five human beings were lynched. And what was the crime of the five men? They were skinning a dead cow, an animal that some Hindus revere as holy. On Dussehra, the youths, who skinned dead animals and sold the hides to tanneries for a living, had stopped their pick-up truck at an isolated place half a kilometre from the Dulena police outpost. The men had a government licence for skinning dead animals. And people who knew them insist they only skinned dead animals. According to a local police officer, as evening fell, the five men --- Virender Singh, Tofa Ram, Raji Ram, Dayanand Ram, and Kailash Baljit --- began to skin the cow that they had bought and carried in their truck from a neighbouring town, Farrukh Nagar. While they were doing so, some people returning from a Dussehra carnival in the nearby Jhajjar town saw them. According to a Dulena police official, "They felt that that these people were skinning a living cow and spread the word in the neighbouring villages. A crowd gathered and after beating these five men, brought them to the police outpost." The five men were brought to the police outpost around 6.30 pm. However, the mob outside the police outpost, instead of dispersing, only grew larger, claim the police. The policemen did nothing to disperse the gathered crowd. Then, according to an eyewitness, two hours later, all hell broke loose. "At 8.30 pm, the noise grew louder and I rushed to the spot to check what was happening," said Devinder Singh, a resident of Dulena who witnessed the lynching. "The mob dragged the five men out of the police outpost, all the while shouting 'Gau mata ki jai [Long live the mother cow] and kept beating them. And around 10.30pm, they were brutally killed." Going by Singh's account, which was seconded by others in the vicinity, it seems to have been an act of colossal negligence by the police. The mob took four hours from the time it brought the five men to the police outpost till the time it massacred them. Yet, all the while, the police did nothing. "The police did not even fire in the air to scare the crowd away," said Devinder Singh. "Nor did they use tear-gas or lathi-charge [baton-charge] the mob to control it." Singh estimates that the mob was a thousand-strong; the police claimed that there were between 4,000 and 5,000 men, and cite that as the reason for failing to control them. "The crowd was just impossible to control," said Deputy Superintendent of Police Narendra Singh, who had arrived at the outpost before the five men were killed. The charge sheet filed by the police does not name any person, just a mob. One of the first steps in the police investigations was to conduct a post-mortem examination of the dead cow to determine whether it was alive when the men were skinning her. The mob had claimed the cow was alive. But a senior police officer involved with the investigation has declared otherwise. "It was a dead cow," he stated. The police are still to find out from where the dead cow was purchased. Strangely, there is little remorse in Jhajjar town or the neighbouring villages. The people argue that anyone who would have killed a cow would have met the same fate, irrespective of his caste. In fact, the local unit of the Vishwa Hindu Parishad and members of the local gaushaala (cow committee) took out a procession condemning the killing of the cow, not the men! They also gave a memorandum to the Jhajjar deputy commissioner demanding that none of the murderers be booked. "The mob believed that they had skinned a live cow. That is something that would hurt any Hindu. They were killed for what did, not because they were lower castes," insisted Jaswant Chowdhary, a former soldier and member of the gaushaala. "Maybe they should have been let off after just breaking a few bones." 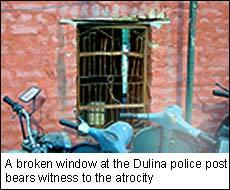 A local priest, Swami Umanand, argued that the killing of the cow was intolerable. "They were killed by the mob only for killing the holy cow," he declared. A week later, on October 22, some students and dalit organisations took out a procession against the killings and alleged the involvement of Hindu religious groups in the murders. A well-known dalit leader, Udit Raj, who is chairman of the All-India Confederation of SC/ST Organisations, has blamed the Vishwa Hindu Parishad for the killings. "I am sure the killing was carried out at the VHP's behest," he said. But the VHP has denied having had anything to do with the killings. Politicians soon stepped in. Sonia Gandhi, president of the largest opposition party, the Congress, visited the homes of the victims and donated money to the families. She also demanded a judicial inquiry into the incident, which was backed by various human rights and civil actions groups. The Haryana government has not conceded the demand for a judicial inquiry. But under pressure from the opposition, Deputy Prime Minister Lal Kishenchand Advani asked for an administrative inquiry. Rohtak Divisional Commissioner R R Banswal, a senior bureaucrat, has been assigned the job. Banswal has put out a notification in local newspapers asking persons with information about the incident to meet him on October 25. He has been given a month to present his 'fact-finding' report. His brief: to record statements, 'find out where the cow in question came from, who handed it over to the slain men, then the administrative lapse'. Strangely, however, he has not been asked to bother with the criminal side of the case. Between 50 and 70 policemen, including a deputy superintendent of police, a relatively senior officer, stood by as five men were lynched. Even after the crime, the police remained tardy: no arrests have been made yet. Asked why this is so, Jhajjar police chief M A Khan replied: "We cannot share any information at the moment. The inquiry is on." 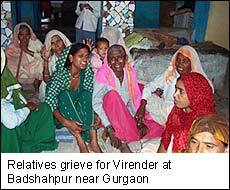 But relatives of the victims read a deliberate motive in the police inaction. They claimed that the police had asked the five men for a bribe and on not receiving it turned them over to the mob, making up the story about a cow being skinned. But no one else has backed this version. Incidentally, the police, who failed to stop the lynching or arrest the murderers, have filed a first information report in connection with the incident: it is against the five dead men under the Cow Slaughter Act!